Meet with your tour guide and departure by 4x4 to Ouarzazate via the Tizi-n-Tichka Pass, continue to the Kasbah of Telouet, ancestral home of the Pacha Glaoui. By Ksours and Kasbahs, including the village of Anmiter, in order to reach the valley of Ounila. Continuation of the trail to join the kasbah of Ait Ben Haddou. Stop photo before returning to Ouarzazate. Dinner and overnight. Departure in the morning from Ouarzazate to M'hamid, passing by the valley of Drâa and its thousand kasbahs. Passing through the village of Agdez and the town of Zagora then, lunch will be revised in a local restaurant in the palm grove before continuing by the old trail of the former Caravans towards M'hamid, last village before the Saharan immensity and the beginning of the Desert to go on camel ride to the bivouac/desert camp, night in a charming camp, comfortable and typical, set in a magical place in the heart of the dunes, set up and climb the dune to contemplate a magnificent sunrise, early evening dinner. Traditional delight, starry sky, welcome to the million star hotel. 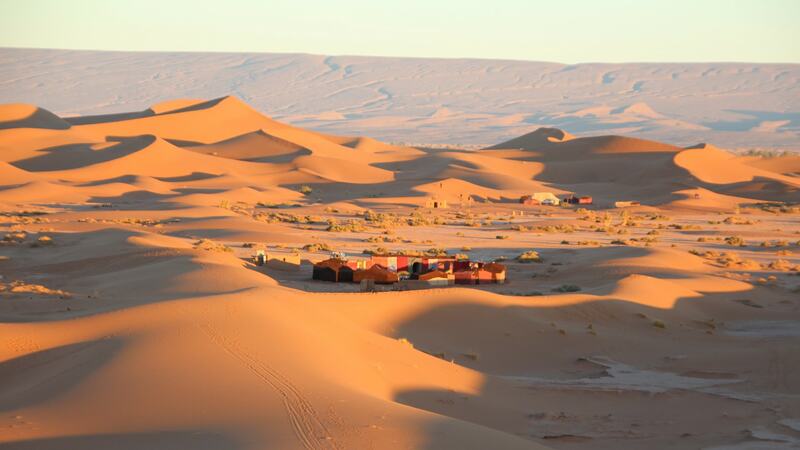 After breakfast, a ride on a dromedary, then a 4x4 by on a sandy track towards the big dunes of Chegaga, the biggest dunes in Morocco, lunch under the shade of the acacias or tamarisk trees, the afternoon resumption of the track to the sea of ​​Chegaga sands. Arrival at the nomadic Bivouac of great charm in Chegaga to witness the sunset, dinner and night under tent/under the sky. Early departure for Marrakech by the track between the erg of Chegaga and the dried lake of Drâa passing by the lake Iriqui, small Stop at Lamdawer to see the fossils, then continuation by Foum Zguid and Taznakht. Back to Marrakech, photo stops will be made during the day between Taznakht and Marrakech before arriving at the hotel.